I'm happy to report that our house is almost all patched up! After spending a night in a hotel room with a 1-year old who is used to having her own room, I was dreading the process, but it was actually pretty hassle free. We only had to stay in a hotel one night and now that it's been about two weeks, we are almost back to how things were! The interior gets finished today when the carpet guy comes and the exterior should be finished sometime next week. So, here's a life lesson - don't get all worked up and negative about something because it might not turn out as bad as you think! Thanks for all your good wishes after last week's post about the accident. Bonnie of Pass the Beans, Please made Baked Potato Soup. Rachael Ray contributed some tips for a frugal eating column in US News. 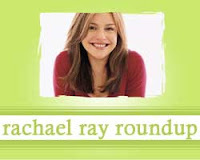 Scott Mindeaux of Foodie in Disguise writes about Rachael Ray's empire. Teresa of Cooking with Teresa made Horseradish Beef Strudels from Every Day with Rachael Ray. Lauren of Lauren's Kitchen made Chicken Cordon Bleu Burgers. Lovetoeat's Blog features Lemon Cream Chicken with Champagne Risotto. A Feast for the Eyes features Quick Tagine-Style Chicken. Mare of Meet Me in the Kitchen made Huevos Rancheros. Megan of My Baking Adventures made Carbonara Deep Dish Pasta Crusted Pan Pizza. Mylinda of Sweet Tea in Texas made Chile-Beef Stuffed Zucchini. Jessica of Weeknight Gourmet made Saltimbocca with Baby Pasta Primavera. Angel of My Corner of the Universe adapted Rachael's recipe for Chicken with Apple Mushroom Sauce from Express Lane Meals. Kim Kardashian posted a cute picture from her appearance on Rachael Ray's talk show. Zoe of EZ Home Cooking made Goat Cheese-Spinach Pizza. Nellbe of Nellbe's Scribblings tells us how to make a gluten free verion of Braised Chicken Drumsticks with Glazed Pears. Yikes! Haven't been here for a few days and just read about the accident! So glad to hear you guys are ok - I can't imagine how scary that was! Hugs!!!! !